Cloud computing has become an exciting multidisciplinary research field, where different computing paradigms and technologies coexist. However, its multi-disciplinary and multi-paradigmatic nature has raised questions and challenges in achieving and leveraging full potential and expectations of use of Cloud computing systems. Among such interesting frontiers there is the “Intelligent Cloud Services and Systems”, whereby Cloud Services are equipped with robust and intelligent mechanisms that enable them to respond to external input and users in an autonomic, smart self-healing manner. This special issue focuses on research issues and challenges on the interplay between intelligent Cloud Services and Cloud Systems, whereby Cloud Systems comprise of the entire ecosystem of entities in Cloud computing such as Cloud broker, Cloud registry, Cloud composer, and could be made up of multiple Clouds. Additionally papers in the special issues explored the use and deployment of intelligent cloud services as a means to manage big data applications to offer new functionalities and advanced user-centric services. The special issue received 28 submissions from an open call and extended papers selected from the 28th IEEE AINA 2014, 13th–16th May 2014, Victoria, Canada (http://www.aina-conference.org/2014/). The IEEE International Conference on Advanced Information Networking and Applications is a major annual international conference sponsored by the Technical Committee of Distributed Processing (TCDP) of the IEEE Computer Society. After a careful review, nine high quality papers were accepted for this special issue. The papers of the special issue are arranged as follows. In the first paper, Leu et al. “Pareto-based Cache Replacement Algorithms for YouTube” deal with some issues in distributed memory caching system used in Youtube. The authors propose an approach to classify videos into popular and unpopular videos through two cache replacement algorithms based on the Pareto principle, namely, Pareto-based Least Frequently Used algorithm (PLFU), and the Pareto-based Least Recently Used algorithm (PLRU). The simulation results based on a real-world YouTube trace showed that PLFU performed the best among all tested algorithms and that PLRU, when is used for a longer time, provided the second best performance. The second paper by Pardede et al. “Maintaining Schema Versions Compatibility in Cloud Applications Collaborative Framework” investigates research issues related to sharing data and schemas in integrated applications within the cloud environment. Since the heterogeneous schemas stored in the cloud tend to evolve across time, there is a need to handle their versions adequately. The authors have proposed a central framework the can be deployed in a cloud environment to aid schema developers and standard groups to track XML Schema changes, maintain versions compatibility, and help in the enhancement of a particular schema version. 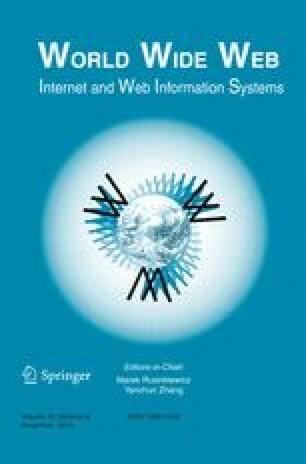 The authors of the third paper, Palmieri et al., “A Triadic Closure and Homophily-based Recommendation System for Online Social Networks” propose a new recommendation system that tries to find the right trade-offs between the exploitation of the already existing links/relationships and the interest affinities between users. The proposed scheme is based on an inherently parallel Hubs And Authorities algorithm together with similarity measures that, for scalability purposes, can be easily transposed in a Cloud scenario. The numerical results, which used a dataset with more than 80,000 users, showed that boosting the weight of similarities between users lead to recommenders that on the average provide more accurate recommendations. In the forth paper, Enokido et al., “An Extended Improved Redundant Power Consumption Laxity-Based (EIRPCLB) Algorithm for Energy Efficient Server Cluster Systems”, propose and evaluated several algorithms for energy-aware cloud computing under replication schemes. In their algorithm, the total energy consumption of a server cluster can be reduced by forcing meaningless replicas to terminate and differentiating the starting time of each replica. The authors evaluate the EIRPCLB algorithm in terms of the total energy consumption and the average response time in homogeneous and heterogeneous clusters. The fifth paper by Taniar and Shao “Enhanced Range Search with Objects outside Query Range” proposes a novel query type named Range-kNN queries that have real life applications in GIS and navigational applications. It tries to deal with the limitations of the query answering using kNN queries or Range queries. The new query type helps in increasing the privacy of users that are not interested in sharing their actual locations but interested in receiving good query results. Indeed, the experiments have shown that the proposed algorithms can improve the accuracy of query results significantly and never have false positive rate, as the input query polygon will be regarded as the query range. The authors Miguel et al. in the sixth paper “Security in Online Web Learning Assessment. Providing an Effective Trustworthiness Approach to Support e-Learning Teams” present an innovative approach for modeling trustworthiness in the context of secure learning assessment in on-line collaborative learning groups. The study shows the need to propose a hybrid assessment model, which combines technological security solutions and functional trustworthiness measures. The model is implemented and evaluated in a real context of e-Learning and using real data from a Virtual Campus. In the seventh paper, Hussain et al., “User-side QoS Forecasting and Management of Cloud Services”, focus on the user-side service management in cloud computing. They present the User-Side Cloud Service Management (UCSM) framework and proposed techniques that assist the service user in the post-interaction phase for cloud service management. The proposed framework can forecast the future QoS of cloud services at the user-side. In addition, the authors showed the applicability of the proposed techniques by using real world data and a case study on the post-interaction phase. The eighth paper by Pop et al. “A Formal Method for Rule Analysis and Validation in Distributed Data Aggregation Service” presents a formal approach to express retrieval and aggregation rules with a compact, called Rule Markup Language. The new proposed architecture is more loosely-coupled with a separate module, the new tool, used for transforming the XML entries to standard XML files which represent the final result. The authors model the dynamic behavior of the system using this new standard to ensure a simpler and efficient representation of the operations performed by the client while maintaining the constraints imposed by a distributed system running in the Cloud. Finally, the last paper “Evolutionary Algorithm-based Multi-Objective Task Scheduling Optimization Model in Cloud Environments”, by Ramezani et al. deals with optimizing task scheduling in a distributed heterogeneous computing environment. The authors have presented a nonlinear multi-objective NP-hard problem, and have shown how such formulation can play a critical role in decreasing service response time and cost, and boosting the Quality of Service (QoS). Two multi-objective evolutionary algorithms, namely Multi- Objective Particle Swarm Optimization (MOPSO) and Multi-Objective Genetic Algorithm (MOGA) were implemented and evaluated. The guest editors would like to appreciate all authors, reviewers and editorial board members for their invaluable contribution during the preparation of this special issue. The time and efforts of the reviewers and their constructive feedback to authors are highly appreciated. We would like to thank the Editor in Chief, Prof. Yanchun Zhang, for the opportunity to edit this special issue as well as for his support and encouragement. We are also grateful to the journal managerial team for their support and assistance. We wish readers will find the papers of this issue useful for their research and academic activity and will enjoy reading! Fatos Xhafa acknowledges support from the COMMAS Research Project TIN2013-46181-C2-1-R Computational Models and Methods for Massive Structured Data.